The Morocco pavilion at World Showcase in Epcot is one that is often skipped. True, it may not be a “romantic” destination like Italy or France, but there’s a great sense of adventure here along with the excitement of trying something new. Morocco has so much to love, if only you’ll take a look and keep an open mind. Morocco has about six gift shops for guests to browse through that don’t feel like the traditional Disney stores. Instead, you really feel like you’re in a Bazaar as you journey through indoor and outdoor booths. You can buy anything from traditional clothing, to music, to fez hats, and even carpets and lamps for your home. Due to the close proximity of Disney’s Hollywood Studios and Epcot, the Tower of Terror attraction can be seen from World Showcase. 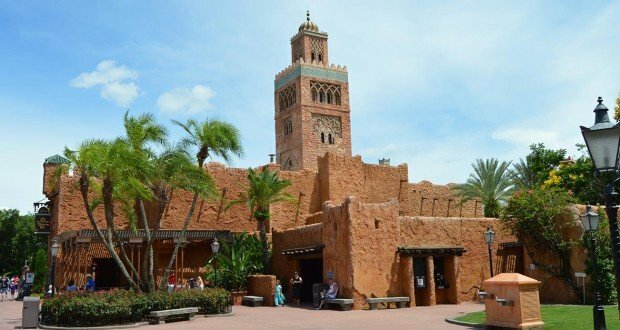 However, when Disney Imagineers were painting the ride, they incorporated the colors seen in the Moroccan pavilion to make it seem like the tower was a part of the county, even from a distance. For those looking to get their feet wet with Moroccan food, Tangierine Café is a great Quick Service restaurant that offers both indoor and outdoor seating. Once inside, pay attention to the detail in the décor from the tables to the lighting fixtures. Dishes here include Falafel wraps, Shwarma chicken and lamb, and even vegetarian dishes. Hamburgers and chicken tenders are available for children. Near one of the shops along the water you’ll find a Cast Member who creates beautiful designs using Henna. If you’re not familiar, it’s a kind of temporary tattoo where a design is drawn on the skin with either traditional or contemporary designs. Once dried, the henna comes off, but the design remains until it fades. You can also get some “pixie dust” (glitter) added for a Disney touch. Located right on the water, guests get a great view of the lagoon while enjoying some local staples, including a variety of alcoholic beverages for those 21 and older. Small plates of food can be found here so this a great place for a quick snack or a light lunch. Dinner entrees are also served here along with desserts like the chocolate pyramid or assorted baklava. If you’d just like a drink, there’s a bar open with local beers and specialty drinks, like the Spice Road Signature Sangria. Morocco’s Table Service restaurant, Marrakesh, is a wonderful feast for the eyes as well as the stomach. Guests feel like they are stepping into a palace with the beautiful stained-glass chandeliers and tiled décor. The food, while it can be scary to try something new, is absolutely amazing. Not overly spicy as some guests may believe, there are a variety of dishes including couscous and shish kebab. Another great perk of dining at Restaurant Marrakesh is the entertainment. Throughout the day, belly dancers come out to perform to guests while live music is being played. These entertainers do not perform outside of the restaurant so this is the only place you can see them. If you’re just passing through, you can still catch some Moroccan entertainment. B’net Al Houwariyate is a group of singers and dancers who will treat guests to a variety of music including Berber chants and Chaabi rhythms. Towards the back of the pavilion, guests will have a chance to meet Aladdin and Princess Jasmine. Sometimes other characters from the film can be found here, but most of the time it’s Aladdin and Jasmine. Lines tend to be a little shorter here due to its location, so it’s a great way to meet some characters without taking up too much time. Just about anywhere along world showcase offers great views of Illuminations, but due to the pavilion’s unpopularity, unfairly so, there aren’t as many people who gather here to watch the fireworks and laser show. Guests should still get here early, though. Morocco is the only pavilion to be sponsored by its government and not a company. The King of Morocco even sent some of his own architects to help create the buildings to ensure an authentic atmosphere. Once inside the marketplace, you’re cut off from the rest of World Showcase and can feel completely immersed in the Moroccan scenery. The tower is a replica of a 12th Century mosque and the detail all the way down to the tiles used in the mosaic designs is breathtaking. Even the plant life is local to the county. Since Morocco tends to be passed over as the food is “too spicy,” or it’s “just shops,” not a lot of guests book their meals here. Showing up at Restaurant Marrakesh without a reservation is usually not a problem and you can be seated with little to no wait. The same goes for the other counter service locations. If you’re looking for a place away from the crowds, Morocco is usually your best bet. If you’re never taken the time to explore Morocco, be sure you do so on your next trip. There are so many wonderful things guests miss out on because they think they know what to expect. This pavilion tends to surprise you and will quickly become a priority on future vacations.